On May 17, 2005, a female chimpanzee in near the Fongoli stream in the savanna of Senegal was observed using a spear to hunt a bush baby (a tiny primate that lives in trees). 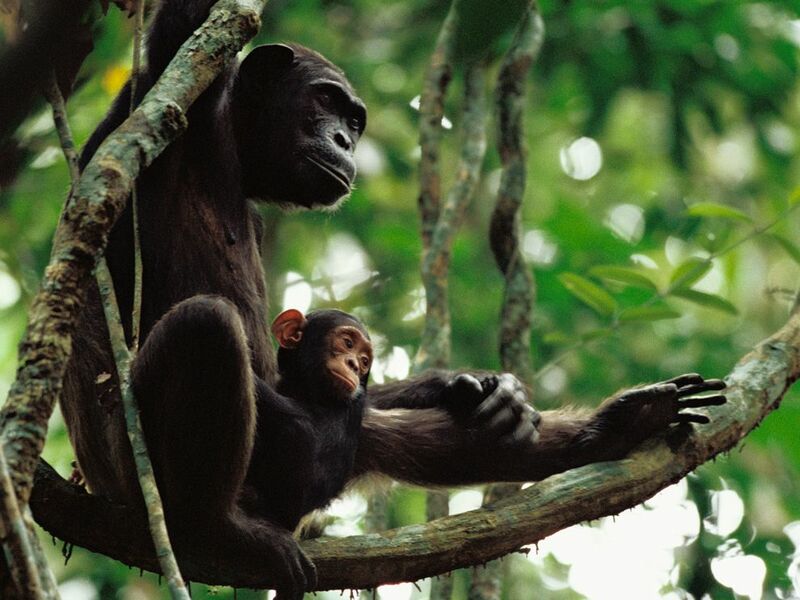 Chimpanzees, like this mother and child in Republic of Congo, is an endangered species closely related to bonobos, gorillas, orangutans . . . and human beings. On May 17, 2005, a female chimpanzee in near the Fongoli stream in the savanna of Senegal was observed using a spear to hunt a bush baby (a tiny primate that lives in trees). Researchers reported the chimp, Tumbo, sharpened a branch with her teeth and held it like a spear in her hand. She rammed the spear into a hole in a tree trunk, where a bush baby was cowering. Tumbo then cracked open the trunk and ate the animal. Chimpanzees had long been observed creating and using tools, most famously shedding leaves from thin branches to “fish” for termites underground. Apes had also been observed in organized hunts for other animals. Tumbo, however, was the first chimpanzee seen using a tool to hunt another animal. This behavior was previously only observed in human beings. anything an organism does involving action or response to stimulation. small mammal (primate) native to Central African forests. large, intelligent ape native to Africa. earlier, or the one before. weapon made of a long metal or wooden shaft with a sharp, pointed end. small insect that feeds on wood. main shaft or stem of a tree.